The Collegiate Peaks region is a popular destination for many year-round outdoor activities, least of which is the climbing of the eight fourteeners in the Collegiate Range. 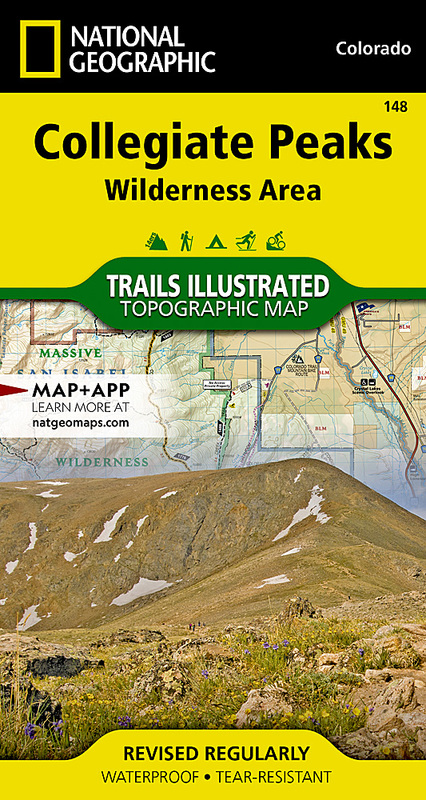 National Geographic's Trails Illustrated map of Collegiate Peaks Wilderness Area delivers unmatched detail and valuable information to assist you in your exploration of this breathtaking wilderness. Expertly researched and created in partnership with local land management agencies, this map features many key points of interest including Twin Lakes, Buena Vista, Leadville, Taylor Park Reservoir, Aspen, Snowmass Ski Area, Crested Butte, and portions of the Taylor and Arkansas rivers. This map can guide you off the beaten path and back again with miles of mapped trails including the Colorado and Continental Divide trails. Trail mileage between intersections will help you choose the path that's right for you. Biking, cross country ski, snowmobile, and motorized trails are clearly marked as well. Portions of the Top of the Rockies, Collegiate Peaks, and West Elk Loop scenic byways are noted for those wishing to take in the scenery by car. Road types are differentiated, so you know if the route you choose is a four-wheel-drive or high-clearance road. The map base includes contour lines and elevations for summits, passes, and many lakes. Some of the recreation features noted include campgrounds, trailheads, river access, fishing areas, interpretive trails, and winter access to 10th Mountain Division huts. Other features found on this map include: Buffalo Peaks Wilderness, Castle Peak, Collegiate Peaks Wilderness, Continental Divide, Gunnison National Forest, Hunter-Fryingpan Wilderness, Huron Peak, Independence Pass, La Plata Peak, Maroon Bells-Snowmass Wilderness, Maroon Peak, Missouri Mountain, Mosquito Range, Mount Belford, Mount Columbia, Mount Elbert, Mount Harvard, Mount Massive, Mount Massive Wilderness, Mount Oxford, Mount Princeton, Mount Yale, North Maroon Peak, Pike National Forest, Pyramid Peak, San Isabel National Forest, Sawatch Range, Taylor Park Reservoir, White River National Forest, Williams Mountains.